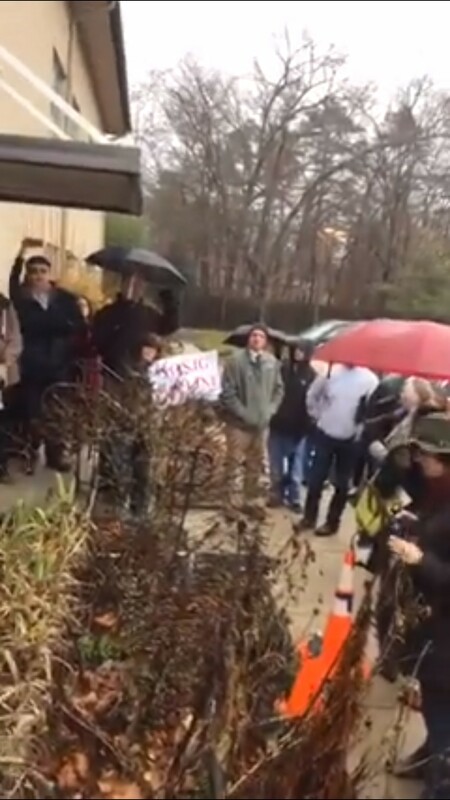 At its peak, more than 300 people are standing outside of St. Anne’s Church in Browns Mills, in the rain and near-freezing cold, forbidden from joining the Pinelands Commission meeting. The ostensibly public meeting is for comments on whether the natural gas pipeline, as proposed by South Jersey Gas, will benefit the Pinelands, and if it conforms to the commission’s charter and to state environmental laws. At 8:45am, forty five minutes before the meeting was scheduled to begin, people were refused entry because the hall was filled to its capacity of 258 people. While the empty sanctuary and other rooms in the church can hold more, they are unavailable. Despite this, late arriving members of the commission and the press are let in. As one commissioner enters, he is stopped by a woman who requests that the meeting be postponed. The commissioner gives a terse and uninterested reply before quickly entering. Live coverage by Jeff Epstein of Citizens’ Media TV. According to the Pinelands Commission spokesman the meeting was moved because, “Ultimately, we wanted to make sure we have enough space…” The meeting was not just for public comment. The normal monthly meeting for the commission, originally scheduled for January 13, was instead moved to the beginning of today’s meeting, adding to the confusion of when the public portion would start, and therefore when people should arrive. 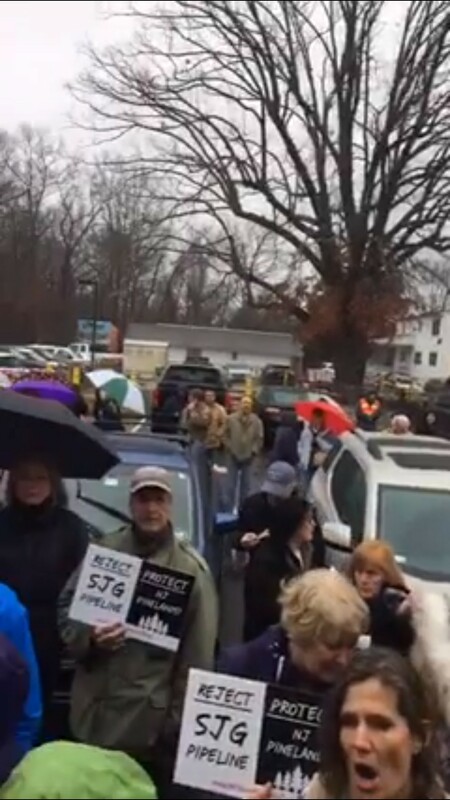 Lena Smith of Food and Water Watch New Jersey says, “This process from the very beginning has intentionally tried to keep the public out.” Lena was later allowed in, shouted at the back of the room to the commission, “There are more than 200 people outside, shut it down!,” and was escorted out by police. A photo of her is the cover photo in the Burlington County Times cover story of the meeting. 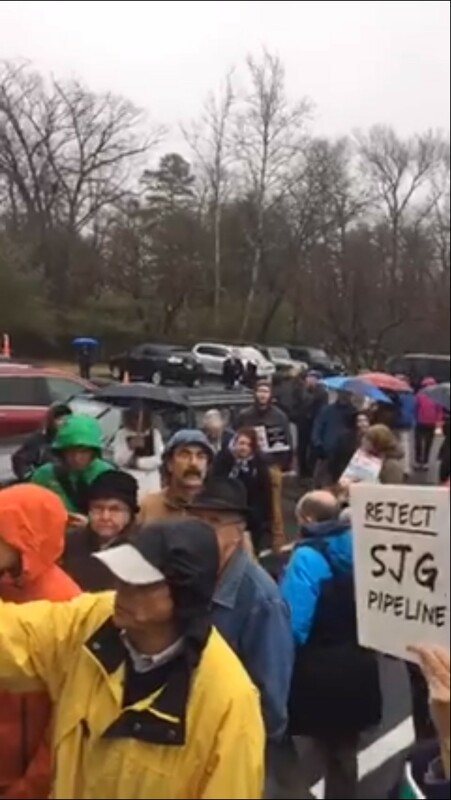 At 9:45, Bill, a member of Chesterfield’s People Over Pipelines and a man with a booming voice, shouts to the officer, “You’ve got 100 people out here, shut it down!” The crowd breaks into a chant of, “Shut it down!” He tells the officer, “This is a public hearing! There are legal requirements for a public hearing! I want to participate, they have to shut it down! This is against the fundamental requirements of due process in a public hearing. You can’t do this.” He tells me the goal of this tactic is to tire the people out so they go away and stop fighting, in order to speed up and ease the permitting process. 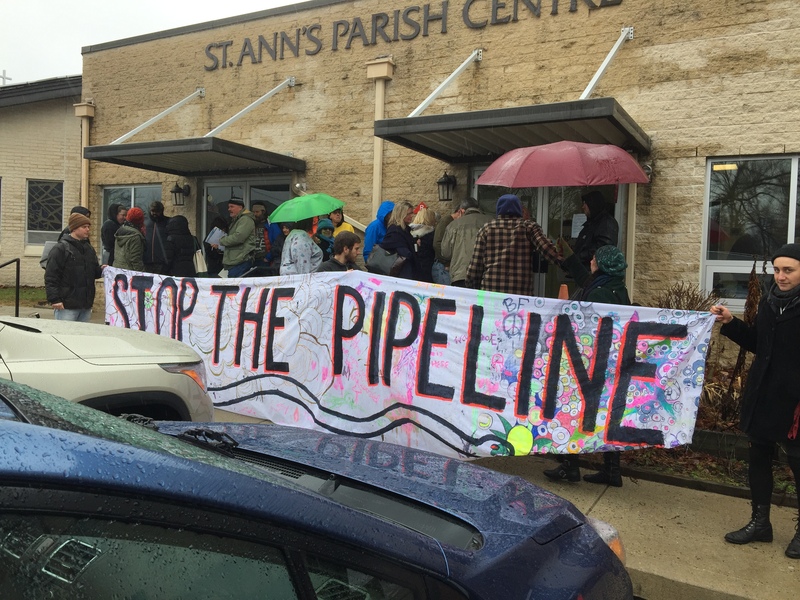 For those against the pipeline, the goal is either for everyone to be let in to give their comments–and to hear everybody else’s–or for the meeting postponed and rescheduled for a larger venue. In August of last year, a similar situation happened. A public comment meeting was scheduled at a conference room in the Ramada Inn in Bordentown Township, that had a capacity for 200 people. Both then and today, there were reports of pro-pipeline union people being bussed in early to fill seats and further limit the seats available to the public. The meeting was postponed and rescheduled to the Chesterfield High School auditorium in October. What do we want?! Shut it down! What do we want?! Shut it down! At 10:30, one of the commissioners comes outside to collect a list of all those who wants to come in and give their comments (and then exit again). 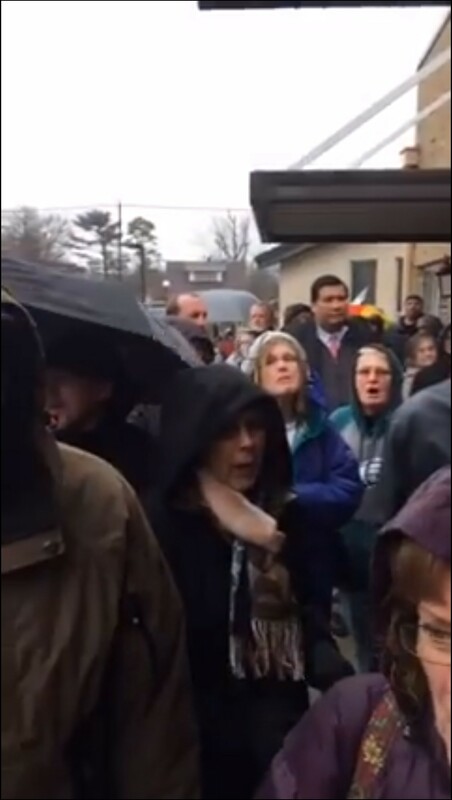 The person that escorts her out shouts, “She’s a commissioner!” The woman pauses at that, and then says, “I’m trying to accommodate everybody.” I ask if the commission was trying to accommodate everyone, why would they choose a venue that could handle less than half of the people? She did not respond. Jennifer Coffey of the non-profit ANJEC, The Association of New Jersey Environmental Commissions has been involved in the fight for New Jersey’s environment for 15 years, and holds two graduate degrees in environmental studies. “I have never had the indignity of attending a meeting like this. I have been out here for three hours. My toes hurt it is so cold, and I’m relatively young and able bodied. There’s no bathrooms!” She makes the point that calling people in from outside to make their comments is unfair, because they have not had the chance to hear any of the preceding comments for context. At 10:45, about half go around to the other side of the building, in order to shout at the windows where the meeting is being held. Two nondescript police cars, one on each sides about 200 feet away, keep tabs. Some in the crowd are coordinating with those on the inside. One is watching a livestream of the meeting. At least two people use much of their testimony time to stand in silence, so the commission can hear the shouts of those being excluded. About half of those on the outside remain at the front door to ensure they will be able to make their comments when called. There are at least five families with young pre-school children standing out in the rain. One mother of a five-year-old was outside for four hours before being let in to make her comments. Other parents escape to their cars for a break from the cold and rain (and from having to constantly hold hands with their children), with some giving up and going home. I arrived at 9:30 but it took ten minutes or so to find parking at the Veteran’s Park at the end of the block. The doors were locked when we got to the door at about 9:45. I waited in the rain with my two kids, ages four and three for about 15 minutes. We returned to the car where we waited for another hour and twenty minutes. We had packed lunch and ate in the car. We then went to a local store to let them get some energy out. Drove back around 1:30 and the parking lot was still full and people were still outside. We had to abandon and go home, because it was too difficult for my kids. Another mother says, “I don’t want my children drinking dirty water.” I joke that her standards are too high. This is on purpose! Shame on you! This is on purpose! Shame on you! The meeting was not postponed, and the cold did indeed disperse most of the crowd. When I left at 12:45, there were around 20 people left. If their goal was to tire people out so they would go away and stop fighting, they succeeded. At least for today. 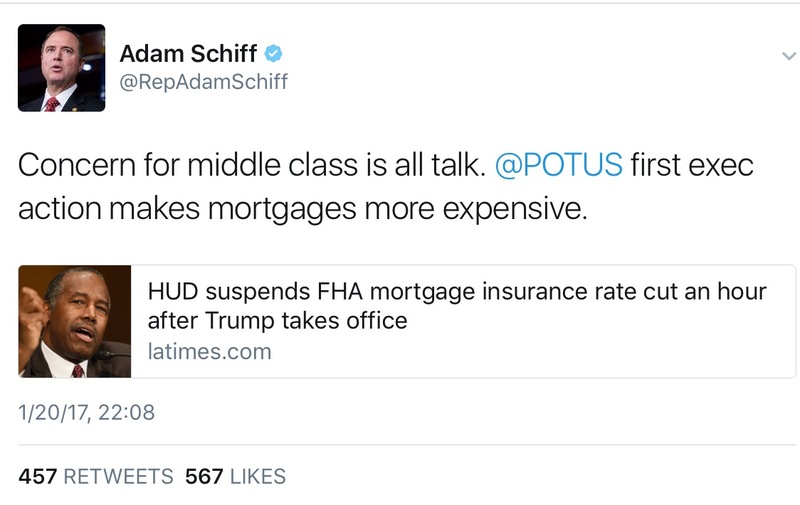 Obama Administration Frames Trump With Faux Mortgage Insurance Rate Reduction, using Americans as pawns. 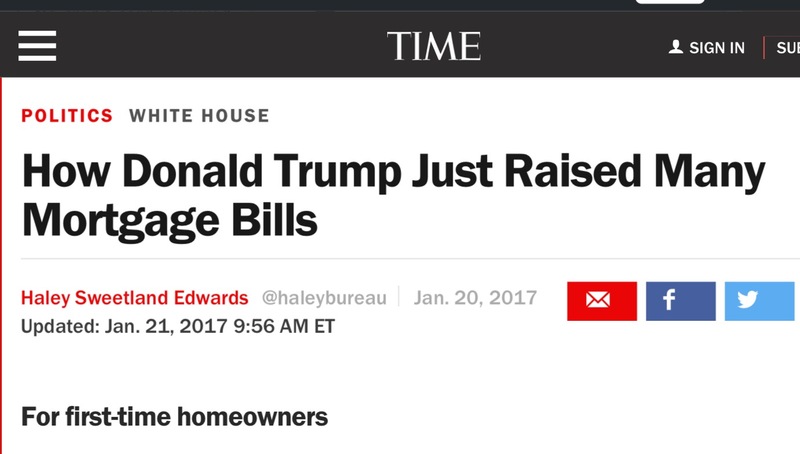 Within hours of becoming the 45th President of the United States, one of Donald Trump’s first orders of business was to sign an executive order to “raise mortgage insurance rates” on millions of homeowners, by around $500 a year. But while it is technically true that Trump did sign the order reversing the decrease, it is a misleading picture. This story is more a negative reflection on President Obama than it is on Trump. Generally speaking, if you are a first time homebuyer and purchase a house with a down payment of less than 20% of the home’s worth, you are required to purchase mortgage insurance. This insurance is to protect the the lender in case you default on your payments. Let’s use the example of a $200,000 home with a $10,000 (5%) down payment. So you need to borrow $190,000. Since January 2015, the upfront MIP (mortgage insurance premium) has been 1.75%, with the annual premium at .8%. So when you sign the mortgage, you pay the upfront premium of $3,325. And then every year, you pay the annual premium of $1,520. As you pay off your principal, this number goes down. The Obama administration’s reduction of the annual premium rate is .25 points (the upfront premium remains unchanged). So with the same loan above, your annual premium would instead be $1,045. That’s a savings of $475 a year, or about $40 a month. 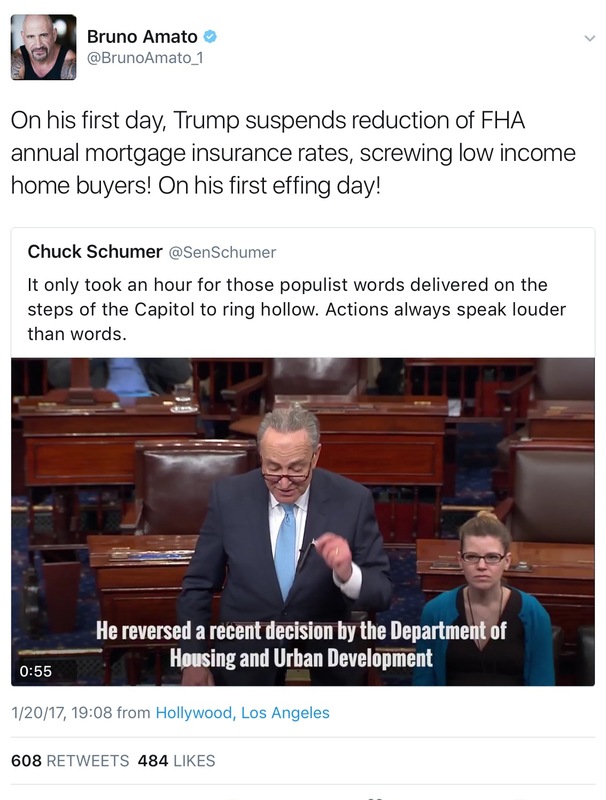 Senate Minority Leader Charles Schumer, D-N.Y., said Friday that Trump’s words in his inaugural speech “ring hollow” following the mortgage premium action. To say that Trump took savings away from the neediest of homebuyers is not true, because homebuyers never had the savings to begin with. The rate reduction was not announced until January 9 of this year–11 days before the end of Obama’s eight year term–and was not set to take effect until January 27, a full week after Trump was sworn in. In addition, Obama’s reduction decision seems to have been made without any advance notice or even a projection document justifying the decrease. As I understand it, both of these things are unusual with a change of this magnitude. Finally, with the announcement made little more than a week before the new administration was to be sworn in, and despite Trump being entirely responsible for implementing this change, the incoming administration was not consulted. Trump, who claimed a populist mantle in his first speech as a president, signed the executive order less than an hour after leaving the inaugural stage. It reverses an Obama-era policy. “Obama-era policy” implies the reduction was made long ago, and has been in force for much of that time. Two days later, you find out that he decided to leave the company months ago, and his final day is Friday. Your raise doesn’t start until a week after that. If that were me, I would be upset at my new boss, but I would be furious at my old one. He had eight years to do something. This was nothing more than an opportunistic political maneuver by the outgoing president, to set the incoming president up for failure. 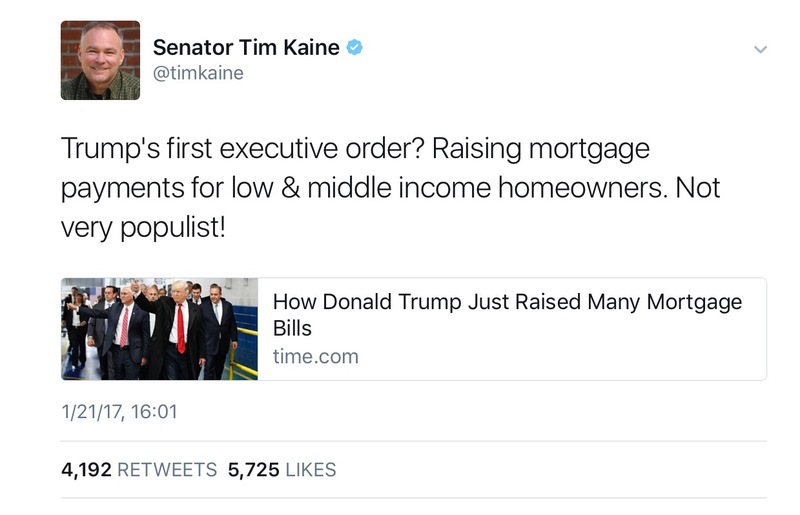 All while pretending to care about American homeowners. If the President Obama really wanted to help Americans, he would’ve considered this move–or something similar–long ago. Instead, he told them he was giving them a gift and promised that it would be delivered by Trump, knowing full well that he would never follow through. Lower-income Americans were used as pawns in a cheap political game. It is not Trump’s responsibility to keep the promises that Obama makes on his way out the door. It is Obama’s responsibility to not promise what is not promiseable. 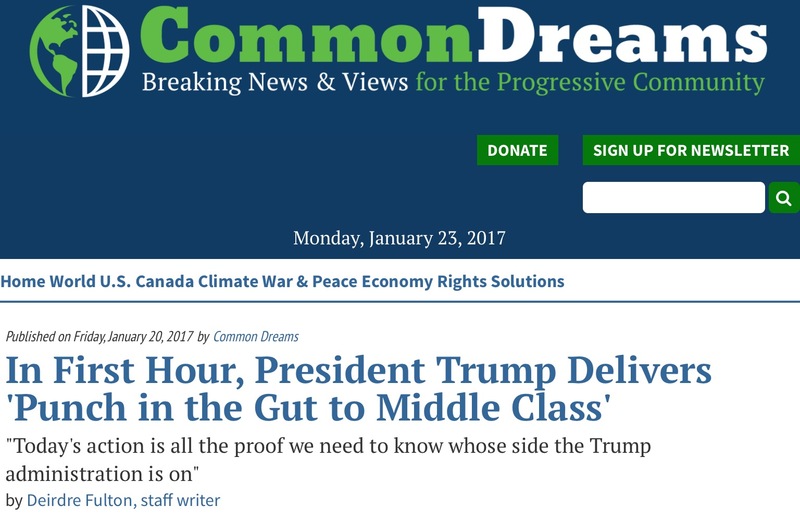 There are so many things for progressives to criticize Trump about. This is not one of them. So who are we fighting anyway? If Democrats do something wrong, we need to fight them. If Trump does something wrong, we need to fight him. If Trump does something right, we need to stand with him. If we can’t win with the truth, we don’t deserve to win. Author aliteralmindPosted on January 23, 2017 February 2, 2017 Categories UncategorizedLeave a comment on Obama Administration Frames Trump With Faux Mortgage Insurance Rate Reduction, using Americans as pawns. 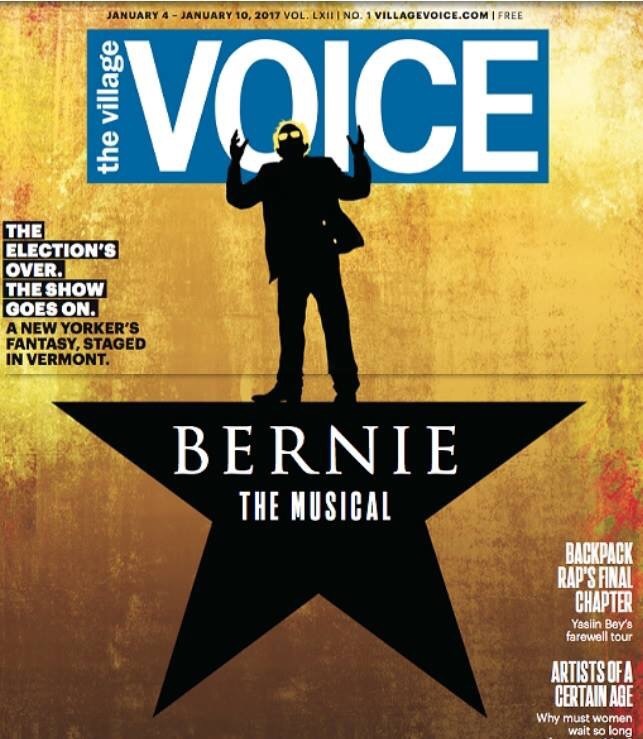 The Bernie Sanders musical I was in last month is the cover story in today’s Village Voice. We are currently scheduling performances in Brooklyn and Manhattan. Author aliteralmindPosted on January 4, 2017 Categories UncategorizedLeave a comment on The Bernie Sanders musical I was in last month is the cover story in today’s Village Voice.